Fearful of something? 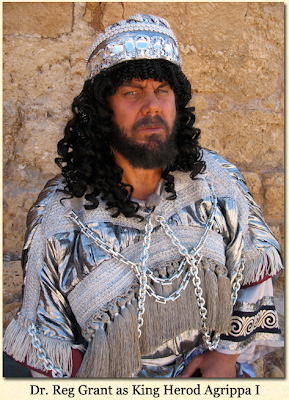 King Jehoshaphat was scared spit-less when Moab and Ammon invaded Israel. He immediately set his face to seek God by praying God’s Word and trusting God’s promises. What can we learn about our fears from this king’s example? I had a marvelous experience today. All credible scholarship points to the Church of the Holy Sepulcher as the true site of Jesus’ crucifixion, burial, and resurrection. The problem is, every time I’m in Israel, the queue to view the Tomb of Jesus has a line two hours long. I have waited for years to see the actual location of Jesus’ resurrection. So this trip, I determined to get there early. I left my hotel at 4:45 AM and caught a taxi to the Jaffa Gate. The dark Jerusalem morning scattered a light rain across the Old City as I made my way through the shadowy streets. I arrived at the church . . . and to my surprise, there were already many people there—at 5:15 AM! I got in the short line for the tomb and I was the next person to enter. Suddenly, a priest stepped in front of me with a chalice and communion wafers. Oh no, I thought. Another priest dressed like Friar Tuck shoved me out of the way (literally), allowing a group of Americans to enter in front of me. The doors to the tomb were shut in front of me. For the next half hour I listed to the private Mass occurring behind the old, wooden doors. A bystander who spoke English told me that there would be consecutive Masses every half hour for the next three hours! The reservations are made two years in advance, he added. My heart sank. I had waited for years . . . I had traveled thousands of miles . . . I had arisen early . . . and now I was going to have to wait again for what stood right in front of me! When the door cracked and the people started to exit, I looked this way and that, and I wiggled in between the worshippers. After the three people remaining in the tomb finished their prayers, I ducked in the low-hanging entrance and knelt before the cold, stone slab where Jesus laid those three days . . . and from where He rose from the dead. After a brief prayer of gratitude for His resurrection, I left the tomb. I searched for a place in the church where I could be alone. I finally worked my way to the lowest part of the building. As I entered the room, I heard the Mass above me begin with beautiful music. I knelt and read the resurrection account from Matthew 28:1-20 while the music filled the nooks of the church. It was a beautiful and spiritual moment I will always remember. As I exited the church around 7 AM, the rain had surrendered its gloom to the bright morning sun. Later this morning, Chuck led a communion service at the so-called “Garden Tomb.” To be honest, I wish the Garden Tomb was the real spot. It’s a beautiful place to meditate on the death and resurrection of Jesus. But what a privilege to visit the real place alone this morning, then to celebrate Communion with other believers immediately afterwards. What a beautiful day it has been. Tomorrow . . . we head home! Thank you for taking this journey with me—and for praying for us. I love the places of the Passion Week in Jerusalem! We saw some of them yesterday and today. 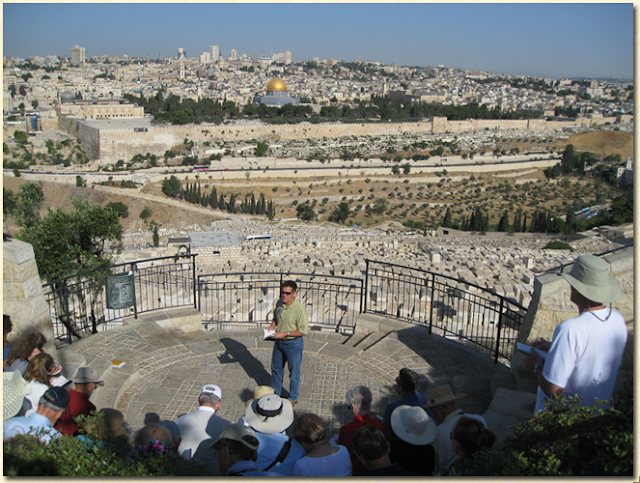 The sprawling panorama atop the Mount of Olives is where Jesus gave His “Olivet Discourse,” outlining the prophetic events surrounding Jerusalem’s future (Matt. 24:3). 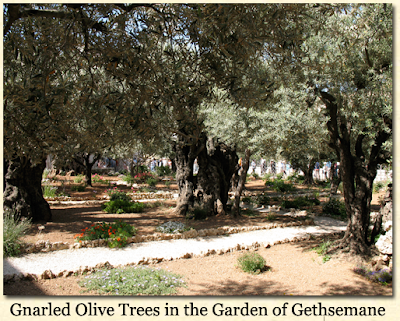 The Garden of Gethsemane at the bottom of the same hill, where Jesus wept in anguish, surrendering His will as He cried out to the Father. It’s ironic that on the same hill where the disciples hailed Jesus as Messiah at His Triumphal Entry, only a few days later they would abandon Him at His arrest. So fickle! (And so much like us.) Interesting also that Jesus wept on both occasions. 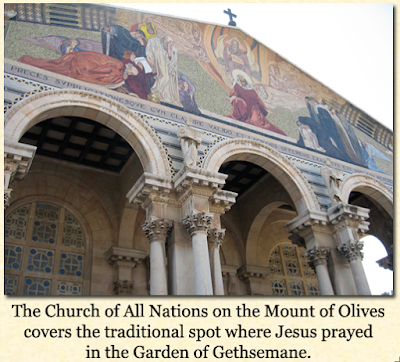 The Church of All Nations covers the traditional spot where Jesus prayed in agony on the night He was betrayed. At the front of the church, four groupings of columns support a massive mosaic that crowns the facade. It depicts Christ gazing up in prayer to the Father who holds the alpha and omega letters. Angels hover near Jesus, and the disciples bow to His left and right. Inside the church a large altar against the center of the back wall overshadows a bare outcropping of rock on the floor. This is the spot where it is believed Jesus bowed in prayer. Person after person approached, knelt and kissed the rock blackened by decades of lips pressed in the same spot. I always find it difficult to believe sincerity in the hearts of the worshipers simply because I don’t share their tradition. When I see Jews kissing a mezuzah (a case with a scroll of Scripture inside of it) on their doorposts, I think of them as devoted. But when I see Christians kissing rocks, it bothers me. I guess the inconsistency of my reasoning reveals my own hypocrisy. For all I know, they love the Lord Jesus far more than I do. Tomorrow . . . we take a day trip to the blistering shores of the Dead Sea and tour Masada, Qumran, and Engedi. Want to know more about how to know God? The answer is here. We arrived in the holy city last evening to the strains of “Jerusalem, Jerusalem, lift up your gates and sing!” blasting through our bus’ loudspeakers. Coming through the tunnel and seeing the Temple Mount for the first time causes various reactions from those on the bus. Tears. Cameras clicking. Eyes fixed. Jaws agape. Sniffles. Shouts. And smiles. I enjoy watching people’s responses. They are always moved at the first sight of Jerusalem . . . yet in so many different ways. 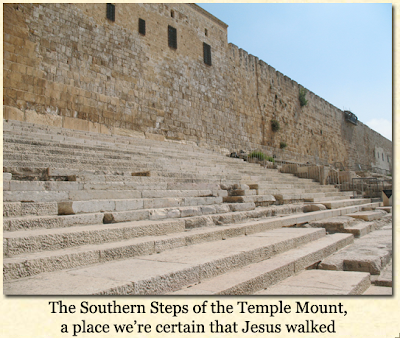 The steps were a place where Jesus would have taught the crowds. Here Gamaliel trained a young Saul, later to become the apostle Paul (see Acts 22:3). Here Peter preached to the crowds on the Day of Pentecost, baptizing thousands in the ritual baths, or mikvot, which still sat next to the steps (see Acts 2:41). We also saw the Western Wall—the remaining stones of the retaining wall that surrounded the temple of Christ’s day. 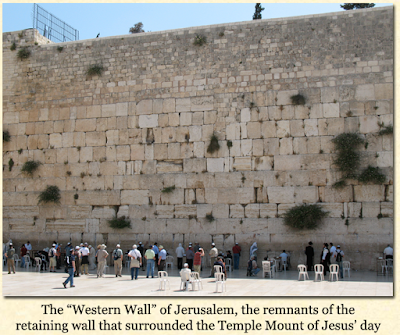 The wall—called Kotel in Hebrew—towers 50 feet above the people below and shaded the busy goings-on from the morning sun. It’s easy in the familiarity of our own traditions to shake our fingers at the oddities of others. Jews pray while rocking, Muslims kneel with their bottoms in the air, and we Christians bow our heads and close our eyes. But without the heart engaged, our worship becomes as phony as those who don’t know the true God. Blend any tradition—bowing, standing, prostrating, rocking, kneeling or jumping—with no personal relationship with God through Christ, and it’s totally pointless. God cares far less about our traditions than He cares about His Word in our hearts and lived out in authenticity. Tomorrow . . . walking the Passion Week of Jesus! Israel is so beautiful in the springtime! This morning Chuck spoke to us from Jesus’ marvelous “Sermon on the Mount.” And here’s the best part: we were sitting on the “mount” where Jesus preached it! There’s something surreal about the real . . . about looking at the “lillies of the field” and the “birds of the air” in the very field and airspace where Christ spoke. Atop this “Mount of Beatitudes,” the Franciscan Sisters constructed a church of gray cinderblocks and white mortar. 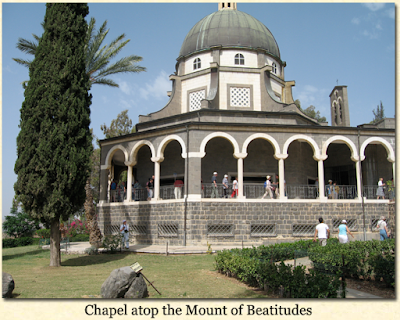 The simple chapel has an octagonal shape commemorating the eight beatitudes (see Matt. 5:3-10) and supports a stained dome topped with a cross. Palm trees, colorful flowerbeds, Saint Augustine grass and plenty of shade make this a tranquil place to overlook the slope and the sea. In the spring of AD 31, after Passover, Jesus came up this mountain, sat down and began to teach those on the grass before Him. Jesus drew on this setting to illustrate simple truths to His listeners: “Do not be worried about your life . . . Look at the birds of the air . . . Observe how the lilies of the field grow” (Matt. 6:25-26, 28). Jesus called the people, “You of little faith” (Matt. 6:30), because they sought tomorrow’s needs instead of trusting God to provide today as He saw fit. 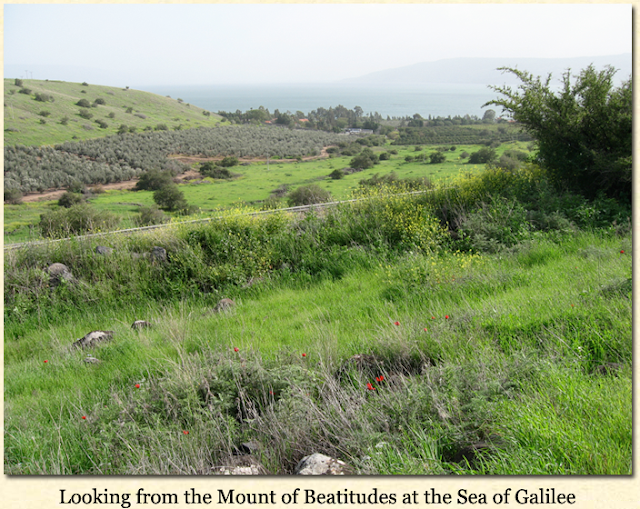 The lessons Jesus gave on that gentle slope in Galilee are illustrations we can see in any part of the world—birds, flowers and grass. God’s continual care of these things gives testimony that He will provide for us too. The first day of a tour is always fun because you get to meet the folks on your bus. What a great crew! We boarded the our buses today to head north from the area of Joppa/Tel Aviv to our first stop—Caesarea by the Sea. The Apostle Peter made this same journey to share Christ with a Roman Centurion in Caesarea (see Acts 10:23-48). What took Peter two days of walking took us about thirty minutes. 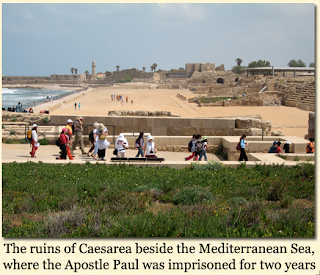 At Caesarea, I felt the cool Mediterranean breezes that would have refreshed Paul as he emerged from his prison to make his defense before Agrippa (see Acts 25:1-27). In the theater, Dr. Reg Grant gave a stirring monologue as King Agrippa, the arrogant ruler who was struck by God in the very theater where we sat (see Acts 12:21-23)! Back in the bus and headed further north, the scenery reminded me how God designed the land of Israel to be strategic during biblical times. The mountains, valleys, oceans, and deserts forced travelers to journey only on certain routes. The most-used road was the International Highway that stretched from Syria in the north to Egypt in the south—the full length of Israel. 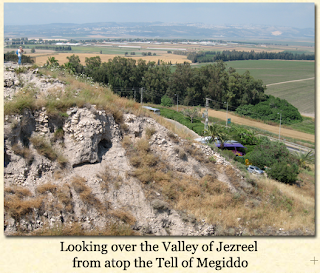 As the highway made its way across the broad Jezreel Valley, it entered a chokepoint at Mount Carmel alongside the city of Megiddo. During the times of the judges in Israel, the Hebrews failed to drive out the Canaanites who lived in Megiddo. So what? Why not let the inhabitants live in this region since they wanted it so badly? The Lord knew why. Not taking control of Megiddo amounted to not locking one’s doors at night. It played a vital role in national security. The failure of the Hebrews to drive out the inhabitants defied God’s command to resist the culture. Instead, God’s people tolerated the culture . . . and then eventually embraced it. Their compromise produced disastrous results, as the Lord had said, “Their gods will be a constant temptation to you” (Joshua 2:3, NLT). It always seems easier to mingle with the culture than to oppose its influence—to find the middle ground rather than stand on our own. But God knows better, and so He commands us, “Do not be conformed to the pattern of this world”; “Flee sexual immorality”; “Do not covet.” God gives specific commands to protect us from experiencing a danger we cannot detect on the outside. We must guard the critical points of entry into our hearts: church doctrine, music, television, the Internet, movies and marketing. No doubt, obedience comes at a hard price, but not as hard as the results of compromise. Compromise is never worth its price. Tomorrow, we enter the world of Jesus . . . around the Sea of Galilee! What it takes to enter heaven is given by God, not earned by men. Forgiveness of sins is free to the one who believes. It is a gift you receive by faith, not one you earn by works. Not only that, if you as a Christian are trying to keep God’s favor through the spiritual disciplines, you never know when you’ve done enough. You can rest from your worry like a child sleeping in his bed at night because all the work is done for you in Jesus. In just a few days, I’ll take my seventh trip to Israel. After going again and again so many times, I have to be honest . . . it never gets old. Why? Because seeing the places where biblical events occurred helps me understand the words of Scripture like little else can. Frankly, I have spent hundreds of hours studying the original languages of the Bible, but nothing has broadened my understanding of the Word of God more than studying and experiencing the places where Scripture occurred. For many who will join us on our tour with Insight for Living, this tour will be their first to Israel. What a treasure awaits them! In addition to following the daily posts on my blog, you can also subscribe to Insight for Living’s Video Blog. There you will see video from each day’s touring . . . as well as candid interviews and photos of folks taking the journey with us. Shalom . . . and thank you for praying! What does God say about divorce? If the foundation of a nation is family, and the basis of family is marriage, then what’s the basis of marriage? God stands ready to strongly support your commitment to Him and your spouse.